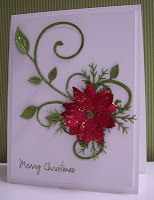 She submits such amazing inspirational cards for each of our challenges and her work is simply stunning! Congratulations Birgit, please send us your contact details which we will pass on to the Ribbon Girl to arrange your prize. This proved to be a really popular week with lots of fab submissions... so here are our choices. What a beautifully vibrant CAS card! There seems to be a bit of a theme going on here, but what wonderful Christmas cards! Congratulations everyone, please take the ShowCASe badge from the page at the top to display on your blogs. DO come back tomorrow for our next Clean and Simple Challenge...see you then! Oh, thank you for including me in your ShowCASe for this fun challenge, it's an honour! Thank you so much, to be in the showcase. Congratulations to all the others shown and special congrats to Birgit, the happy winner! Ooh thank you sooo much!! Love the other cards too!